Guilin now has 112 air routes to and from 76 cities around world. Among all the destinations, 12 of them are located outside China like Seoul and Singapore, and the rest 64 are domestic cities like Beijing and Shanghai. All the flights are operated at Guilin Liangjiang International Airport, the only airport in Guilin and the largest civil-use air hub in Guangxi Zhuang Autonomous Region. Guilin Liangjiang International Airport is located in the west part of the city, 27 kilometers (21 miles) away from the city center. There are 2 terminal buildings in this airport, but currently only one of them is in service. Passengers of this airport can transport to other areas of this city by 3 shuttle bus routes, or they can take a coach directly to the neighboring tourist attractions at the long-distance coach station in the right side of the domestic arrival hall on 1F. How much does it cost to fly to Guilin from overseas destinations? In general, the price range of an economy class flight ticket from Seoul is CNY 2,000 - 2,500, from Hong Kong is CNY 1,100 - 2,200 and from Kuala Lumper is CNY 1,200 - 2,000. The fluctuations on the prices of international air tickets are very common. For passengers searching for real-time prices and ticket fare of more air routes, use the search box on page top. 1. Avoid flying to Guilin in peak season and holidays. Generally, the discount on domestic flight ticket fare in low season from November to next March varies between 30%-60% off, in peak season from April to October changes between 20%-40% off. In holidays like Chinese New Year and National Day Holiday, there may be no discount at all. 2. For international passengers, check the flight ticket to nearby cities like Guangzhou and Shenzhen. If the fare to these cities is much lower, you can choose to fly there and then change to a high speed train to Guilin. 3. Fly with the no frill airlines like Spring Airways or Asiana Airlines. However, if you get a cheap flight ticket from these airlines, make sure you know the luggage allowance because it is often very little. If you think the luggage allowance is not enough for you, it is more recommended to buy extra baggage allowance on the official websites of the airlines beforehand, because the cost will be cheaper than at the airport. 4. The flight with a stopover is sometimes cheaper than the through flight. 5. The round-trip flight ticket usually enjoys higher discount than a single-trip ticket. Are they any flight to and from Bangkok ? where can we book ?? There is CZ6099/CZ6100 available between Guilin and Bangkok with a stopover in Nanning. It is offered by China Southern Airlines. You can book with the airline or other tourist website as well, like this one. There seems no direct trip to Hoh chi minh, but you can transfer in Guangzhou. If we book a flight, how can we check in? We want to book flights from Belgium-Europe for a flight from Xi'an to Guilin. I'm wondering how we can check in? In the airport, on your website, on the website of the airline,...? They all use the e ticket now, you only get a e ticket number after issuing. You need to show your passport at the booth in the airport to change the boarding pass. I think there is one flight BK2759 15:20/17:05 available everyday, but sometimes this flight seems sold out thus not available for some dates. You can check on this page by detailed date. would like to fly from Guilin to Kathmandu, is there a direct flight or an one stop flight? It depends on the date. For some dates, there are direct flight from Guangzhou or Kunming to Kathmandu. 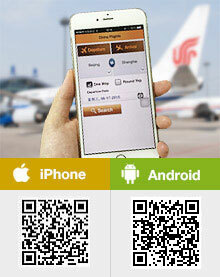 You can check the date and choose to go Kunming or Guangzhou first. it seems the flight of Hamburg Airline has been cancelled. now only Dragon Air and Hong Kong Express operate flights from hong kong to Guilin.